EAGLE, Idaho, May 13, 2013 – Ordinary potato puffs are enjoying a revolutionary makeover with the introduction of new Alexia Crispy Seasoned Potato Puffs. Alexia Foods, a line of premium, all-natural frozen potatoes, breads, and side dishes, brings a ‘grown-up’ taste to a classic childhood favorite with its latest puff variety. Each crispy Alexia Seasoned Potato Puff is made with the finest all-natural ingredients and seasoned with a delicious blend of roasted garlic, cracked black pepper, sour cream and chives. 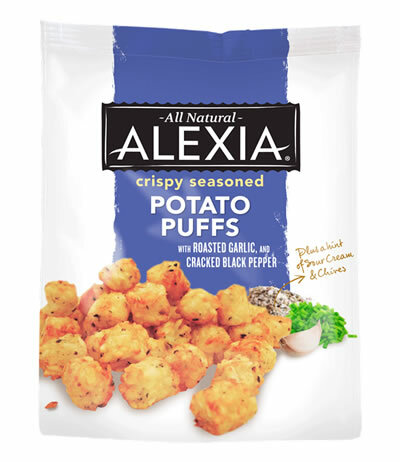 New Alexia Crispy Seasoned Potato Puffs are made with hand-selected, all-natural ingredients. Paired for dinner with a gourmet sandwich recipe or enjoyed with gourmet dip, the scrumptious flavor of the seasoned puffs makes simple dining extraordinary. The premium potato puffs are available at retailers nationwide for a suggested retail price of $3.89 and go from the freezer to the table in approximately 20 minutes.